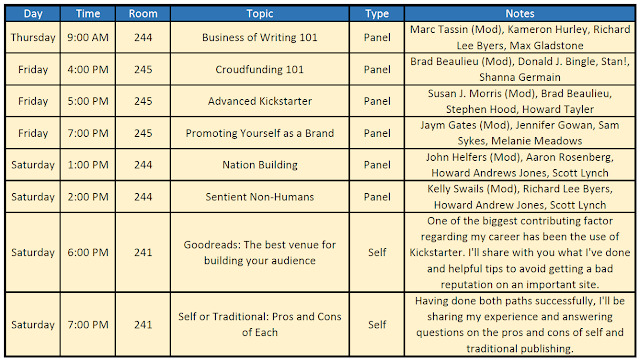 First, sorry for anyone who tried to find the 9:00 session yesterday as the room number was wrong - Doh! Also, Robin noticed I have a 7:00 pm session today so she updated the schedule. Here is when I'm is where I'll be and when. Been VERY busy, so if you've been mailing, tweeting, or posting on facebook, I've likely not seen them. Will be back to online stuff soon! Sorry all, I just noticed how long it has been since I've made a blog post. Things have been wicked busy...and also I'm on the road which makes online communication more difficult. So here's a quick update. Robin has finished the alpha read of The Death of Dulgath and officially put her stamp of approval on it. Yes, she had some changes, but they were (a) good and (b) easy to incorporate. I completed most of them yesterday, and will be finishing up a few other ones as soon as I get done with this post. We are currently in Newago Michigan, staying at a lodge called "The Shack" - interesting place, a big log cabin on a lake that serves banana splits every night. We've been swimming, writing, editing, and enjoying a very quiet retreat. We'll be leaving in a few hours which brings me to my next bullet. 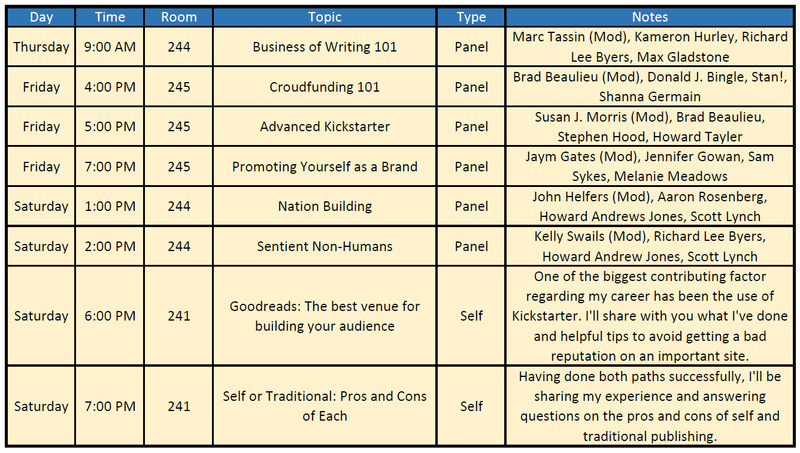 I also will be meeting with a few authors and doing a podcast - but outside of these times, I'm available for a meet and greet or just to say hello. Email me and we can setup a time if you wish. Humbe Bundle - continues to go strong. At last check nearly 12,000 people have gotten theirs and there is a bit over 4 days left. My sciene fiction novel, Hollow World is included in the bundle. You can get 5 books originally started on Kickstarter for a "name your own price" or if you pledge $10.50 you can get 17 total books and comics. If you pledge $15 you can receive 21! That's such a great deal - don't miss out. Here is a link to get your own copies. 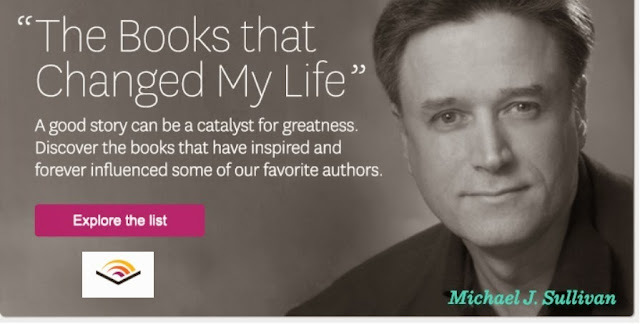 Writer's Digest course on Goodreads - I'm doing an online seminar for writers and how to utilize Goodreads to help build their brand. It'll be done through Writer's Digest University on August 18th at 1:00 PM (although you can participate "off-line" after this date as well. Here is a link with all the information. If you can't get to my session at Gencon about this topic, then this would be a good place to learn more about this important venue. Death of Dulgath Kickstarter, is over, but people are still joining the fun (via PayPal), You can check the Kickstarter to get a list of what the additional add-ons are, and you can click here to place an order. I think we have everything set for sending the surveys. There was a problem with SKU's that Robin fixed earlier today. So should be soon! Well, I think that is all there is for now. Busy times and lack of Internet makes posting a challenge but I'll do what I can to keep everyone informed. I'm a few days late in this post, but for good reasons. When the Kickstarter ended I had three chapters left to write for The Death of Dulgath, so I've been busy finishing it. Today I'm writing the LAST chapter...and then it's off to Robin, who is a very busy woman as of late. It was an amazing experience, made easy thanks to my incredible wife, Robin. 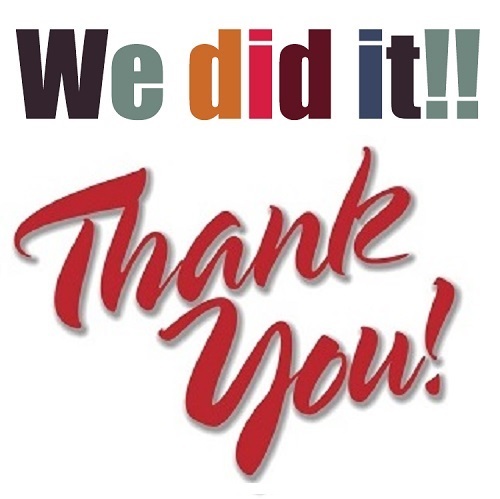 Thank you all for joining us and making the Kickstarter such an event. It's been an amazing ride, and while there is still 8 hours to go for the Kickstarter, I feel that hitting the $70,000 mark pretty much puts the cherry on the top of this sundae. This project turned out to amazing and we became the 3rd highest funded fiction project of all time. The backers are getting all kinds of cool rewards (thanks to exceeding so many goals). Here's the final tally at each reward level. Signed bookmarks ♦ Signed postcard ♦ Digital map ♦ Digital graphic adaptation of The Jester ♦ Wallpapers ♦ Acknowledgement in the book ♦ Social media shout-out ♦ Access to video diary ♦ Making of the Death of Dulgath e-book ♦ First chapter sneak peek of all First Empire novels before anyone else sees them ♦ Riyria Revealed e-book ♦ The Death of Dulgath e-book ♦ Hollow World ebook ♦ The Jester (short story) e-book ♦ Professional Integrity (short story) e-book ♦ Traditions (short story) e-book ♦ Burning Alexandria (short story) e-book ♦ Critique of up to 10,000 words of original writing. Again, I can't thank you all enough for the amazing support. We became the third most-funded project in fiction and have more backers than just about any other project. (There is one in the US that beats us and two if you expand the list worldwide). If you haven't backed, and still want to, well there are just under 9 hours and counting. Come on over and join the fun! Here's the link. To Be Or Not To Be is a hilarious choose your own adventure telling of Shakespeare's Hamlet. You can play any one of various characters and find out how the stories goes as you make your decisions. My daughter bought this for me and it was only later that I realized it was originally created through Kickstarter. In fact, it's one of the highest funded publishing projects of all time (15,352 backers raised $580,905). Ryan North is an acclaimed writer and comic with a massive fan base. I highly recommend this book. Hollow World - is of course my own science fiction novel. It's about a man who uses a time machine to escape his failed marriage and multiple regrets in the hopes of finding a cure for his terminal disease. 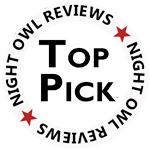 He finds himself 2,000 years in the future in the midst of a muder mystery. Along the way he learns what it means to be human, what's the true meaning of love, and what sacrifices need to be made for paradise. Of course I recommend this as well. Help Fund my Robot Army - is an anthology put together by John Joseph Adams, an amazing editor with a whole slew of anthology credits to his name. This was a really neat idea, story-telling through the format of a Kickstarter. I have a short story in here called "Be Careful What You Wish For" which does a play-off of the Monkey Paw short story most of us read in our youths. Besides myself, there are contributions from Scott Sigler, Seanan McGuire, Chuck Wendig, Harry Connolly, Tobias S. Buckel, and several dozen more. It's very entertaining and each one is a short little read. Again, something I recommend highly. Again, I'll discuss these in more detail in a future post but I should note that The Warden and the Wolf King is the highest funded fiction project of all time - I know this because The Death of Dulgath Kickstarter is sliding into third place - very distantly behind it. The Humble Bundle only runs for 14 days and it went live about five hours ago. Still, it's already raised more than $10,600 with 1,160+ people purchaing it. Check it out and I hope you find something you like. We've sold out a number of the reward levels, added a bunch of add-ons, and provided all kinds of bonus material through the stretch levels. 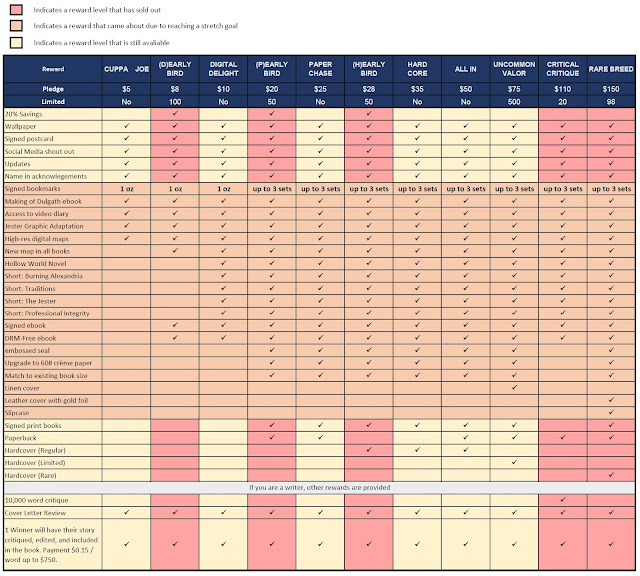 The easiest way to see what is currently available via the Kickstarter is through these graphs (click on them to see higher resolution copies). Another $1,478 will unlock Stretch Goal #11, providing all Kickstarter members sneak peaks to sample chapters of The First Empire books before anyone else sees them. There are other goals above those, but making them is more than enough work for the remaining 52 hours. It's been a great run so far, and I hope we have a really strong finish. Thanks again for all the amazing support. I must admit to being thrilled when The Death of Dugath project was named a Kickstarter Staff Pick. Only a small percentage of projects get that distinction, so it was a great honor to have one of the staff championing the project. So imagine how I felt when I learned that it was selected to be The Publishing Project of the Day! This means we are the featured project on the Publishing Discovery page, which will no doubt get it seen by a lot more people. This is no small feat. At the time I wrote this blog post, there were 629 active publishing projects and only one gets to be the top dog for any given 24-hour period. Why was it picked? To be honest I don't know, but I'm sure the "chatter" from enthusiastic supporters on Facebook, Twitter, Goodreads, and other social media sites certainly helped to get it it noticed...not to mention it's raised nearly $60,000 in just a bit over a month. We are now down to the final 5 days of the project, so please keep up the good work about spreading the word. If you know someone who you think might like to travel with Royce an Hadrian on this adventure, please reach out and let them know about it. Your generous support has given The Death of Dulgath a fabulous launch which we should be able to parlay into bookstore and library success. What's more, I'm glad to provide all the perks and extras for the backers - it's a win-win for all of us. More often than not, Humble Bundle isn't focused on books...it does a lot of game bundles and a fair amount of comic bundles. But when it does do a bundle with books it's something really special. For instance, in October 2012 they did a bundle of fantasy and science fiction that included books from Neil Gaiman, John Scalzi, Cory Doctorow, Paolo Bacigalupi, Lauren Beaukes, Mercedes Lacky and six other authors. 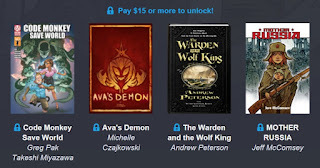 Now here's the really cool thing about Humble Bundle...the reader gets to choose not only how much they want to pay for the bundle of books, but how they want the money distributed. For each project, Humble Bundle chooses two reading related charities and when you buy the bundle you can determine how much money goes to Humble Bundle, how much goes to the authors, and how much goes to the charities. It's such a great idea...and because it's a bundle of books not only do you get something you were looking to buy, but usually some other things that you can discover that you hadn't even realized. All at a fraction of the full-price cost. For just $10 you could get 8 really great audio books - that's a great deal! That's a really diverse set of books, but trust me they tie together rather nicely. I can't say too much more about the bundle until it is launched, but I can say mark your calendar for Wednesday, July 15th. The bundle will go live at 11:00 am Pacific Standard Time. I'll have a lot more to say then. You'll want to get involved right away for two reasons. 2. Bundles only run for VERY limited periods of time. 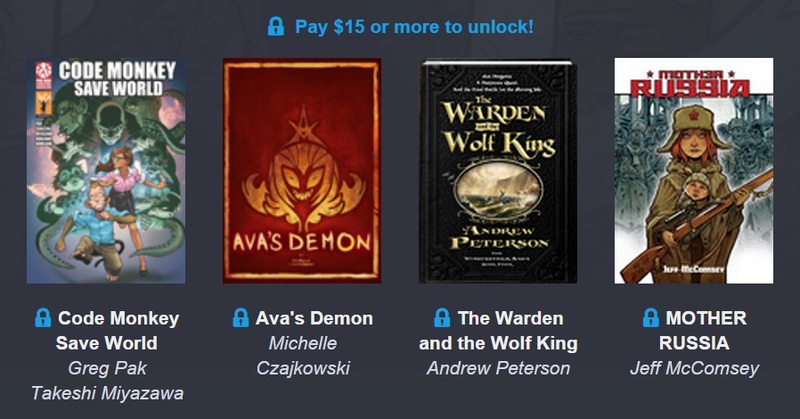 I'm really excited to be included in a Humble Bundle, the last one got an amazing number of readers in just a few short weeks, I hope this next one does equally well. Stay tuned, more about this on the 15th! Yep, The Death of Dulgath wrapped up today, one day later than I thought. I just had too many interruptions yesterday and I didn't want to rush it. So what are the next steps? Then the book is essentially done and be sent to the printer and the audio producer. So, that looks like a lot left to do, but it will go by very quickly. There are some books that I know are "rougher" than others and I think this one is in really good shape. Of course until I start getting feedback from Robin and the beta readers I won't know for sure, but since this is my 29th novel, I have a pretty good feel for such things. Not sure if it is because of the Kickstarter or not, but Robin just noticed that The Death of Dulgath has moved up on the Can't Wait Sci-Fi/Fantasy of 2015 list (from #13 to #11). Now it's just outside the Top 10. Other changes since last time are a swap between Robin Hobb's book and Joe Abercrombie's. 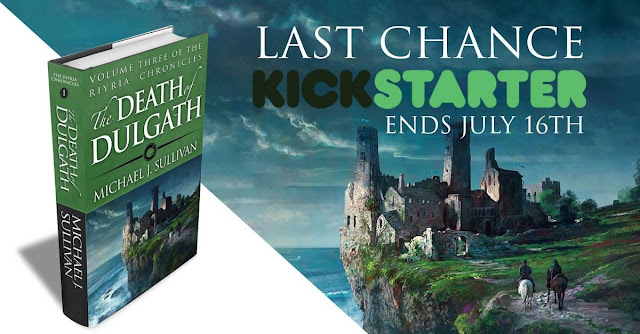 I'm starting the last chapter of The Death of Dulgath and the Kickstarter is entering its final stretch (9 days 14 hours left). Originally my schedule was to finish writing the first draft by the end of July, take a few weeks for going over it, and get the book to alpha by mid August. Current schedule has me finishing up today or tomorrow, and I'll probably only need a week for pre-alpha changes. That means Robin might get the book as early as July 15th. We'll see, but in any case I'm definitely ahead of schedule, a good thing when on such a tight deadline. As for the Kickstarter, it did remarkably well over the holiday. I expected the pledges to dry up to a trickle for July 3rd - July 6th but it brought in almost $2,700. Thanks all for the continued support. That added push made us hit a new milestone. We moved up two spots from #8 to #6 on the all-time highest-funded US fiction projects. Looking at what's ahead of us, I think it may be possible to hit #4. We are just $3,540 away so that's just $393 a day. Speaking of meeting goals, we are fast approaching Stretch Goal #8 (just $621 away). It'll be interesting to see how this all comes together. Robin is running an analysis for me on the guesses people came up with, but already we blew by a lot of them so we're outperforming what most people thought we'd end up with. Thank you to everyone helping to spread the word, your help has been greatly appreciated. With the holiday coming on, I'm sure things will slow down, but The Death of Dulgath Kickstarter continue its climb up through the most funded US fiction projects. Within just a few hours we moved from tenth, past ninth and are now in the top 8! Incidentally, spot #8 is where Hollow World landed during my last Kickstarter, but it was a lot easier to do back then. It finished out at $30,857 to hit that ranking. Where are we going to end up? Well my guess was wrong. I thought it would max out at $50,000. Robin's guess is higher than mine but I won't say what it is just yet. We held a contest and there are still 156 estimations above it's current level. I can't expresshow glad I am that so many people are excited about the new book, and are joining in the Kickstarter to get not only it, but some really cool perks as well. Given where we started, and where we are now, it's worth laying out the original intention and what we are currently shooting for. Originally we figured it would cost about $33,600 to publish the hardcovers in a 5,000 print run. We put the Kickstarter goal at $26,000 and were planning on picking up the other $7,600 ourselves. When setting the "dates" for the Kickstarter we originally wanted 1 month, but given it started June 4th that would make it end right during the 4th of July weekend here in the US (not a good time as most people would be out with friends and family). So, we could make it shorter, or extend it past the 4th. We went with pushing it back, figuring it would take at least 30 days to fully fund. Boy were we wrong! In hindsight we should have pulled it forward...who knew? With the goal met so quickly (less than two days) we started thinking about what else we could do. Doing a print run for the trade paperback so it didn't have to use print-on-demand (which is expensive and not as good of quality), seemed like a pipe dream, but thanks to the backer that became a reality. With regards to the printing, we originally quoted for a nice "middle of the road" book. After all, the best chance of clearing the bar is keeping the cost low. But in short order we cleared another stretch goal that allowed us to upgrade the paper stock, cover materials, and provide a slip case for the rare versions of the book. With extra money coming in, it opens up some possibilities that we wouldn't consider outside a Kickaterter. Things like a "real map," graphic novel adaptation of a short story, and posters of Marc's amazing artwork. I'm thrilled we reached these goals. From the sounds of things, people are really looking forward to them...me most of all! Everyone receiving a printed book can have it signed and personalized. Everyone will receive signed bookmarks (9 for those getting packages, and 1 oz worth for those who only have digital rewards). Signed and personalized ebook versions available for backers up to goal #4 - this one will be tough to do, but I'm glad to provide something that I've not seen done much. 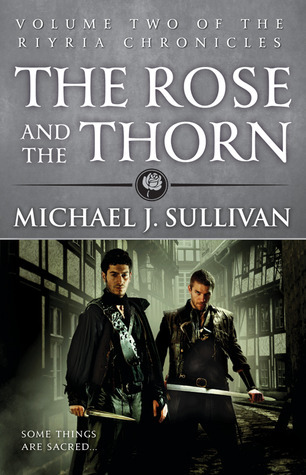 Everyone receiving a physical book will have it embossed to show it as a "special edition"
Trade paperback books will be the same size as the other books in the series. Everyone will get introduced to a new author through a short story I'm bundling with their books. 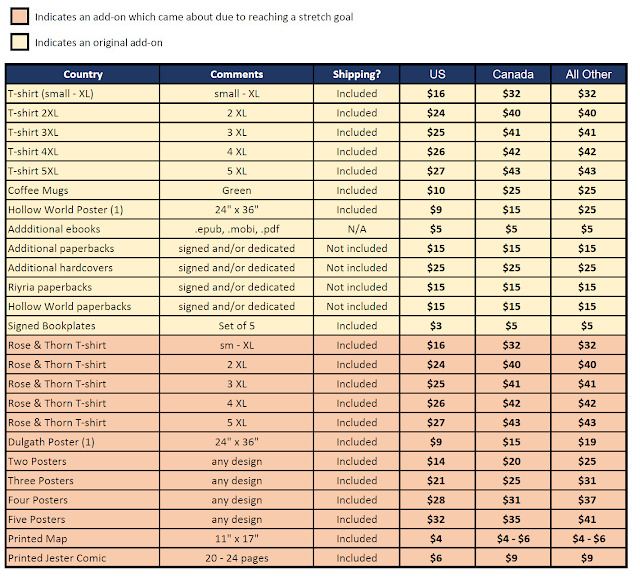 All these cool little perks just couldn't be done easily without the concentrated sales that a Kickstarter provides. It's one of the really cool things about being a backer (as opposed to just buying the book). Plus, as I mentioned before, backing a Kickstarter means MUCH more of your money comes to me rather than middle men such as retailers and publishers. As I said we are still two weeks out and there are still more stretch goals to go. Here is what we have on deck. $52,000 - All backers will get a free ebook edition of Hollow World (my science fiction novel) as well as a number of short stories...they'll be the first ones to get Professional Integrity in ebook form (outside of the Blackguards anthology where it was originally published). $55,000 - I'll brave my fear of the camera and do a video diary talking about what I'm doing, industry news, and other cool things related to my writing or publishing. $58,000 - I'll make a "behind the scenes" ebook about the process of creating The Death of Dulgath. I think it'll be interesting for both readers and would-be authors. Whew, that was a lot, but the Kickstarter has really been something, and I wanted to give a comprehensive updated. I'm truly honored and amazed by the generous support of the backers. I hope you've enjoyed being a part of bringing the Death of Dulgath into reality as much as I have.